Okay peeps! We all know that chevrons (or zig zags, if you prefer) are all the rage right now, so I thought I would take pictures of my process on this one and write up a little tutorial for how to create a quick and easy chevron quilt. Y'all know I'm all about quick and easy! The important thing to remember is that once you have the basic construction down, you will be able to modify the design to suit your needs. So let's talk about one of the cornerstones of many beautiful quilt blocks- the Half Square Triangle, or HST for short. Let me just tell you right now that if you're afraid of them or dislike them, we're going to conquer that with this quilt. And afterward, you're going to wonder why you ever hated them at all! If you can make HST's, you can make a chevron quilt if you just pay attention to a few details along the way. Start by choosing several fabrics to create your chevron stripes. You can choose to have just a few that repeat, or eleven different fabrics as I have here. You'll need fat quarters or quarter yard cuts (make sure you have a full 9 inches in width if you choose quarter yard cuts) for each chevron. Arrange your fabrics in the order that you want your chevrons to be on your quilt. I've separated like colors so that they aren't touching each other, but go with whatever is pleasing to you. Take a picture of your fabrics, all laid out in order. I promise, it could be a lifesaver later on! From here on out, keep the fabrics in this order for every step. 1. This method leaves bias edges, so the blocks are prone to stretching- True, but I'll explain later how I deal with this, and they're no problem. 2. This method produces HST's that aren't exactly whole or half inch sizes. Again, this is true, but here's the thing, as long as they're all the same size (which they will be) this isn't a problem. Since our entire quilt will be made from HST's, they'll fit together with each other, and we won't even have to do any trimming! Alyce at Blossom Heart Quilts made this nifty chart that gives the starting square and finished HST sizes and I'm including it here with her permission. Thanks for all the math, Alyce! Now that we have that out of the way, let's get down to business, shall we? From your first and last fabrics, cut two nine inch squares, and cut four 9 inch squares from each of the rest. Remember to keep them in order when you stack them up! Take your lovely stack of squares and pair up the two squares from the first fabric, with two squares of the second fabric. Then take the remaining two squares from the second fabric and pair them with two squares from the third fabric. Continue pairing your squares like this until you've reached the end of your fabrics. Time to make your HST's! Take your pair of fabrics and put them right sides together. Sew a 1/4 inch seam all the way around your squares. Yes, sew it closed. I promise it will make sense in a second. Repeat this for every pair of squares. Take your sewn squares to your cutting mat, make sure they're straight, and cut corner to corner, in both directions. Cut all of your sewn pairs in this way. You can leave them closed for now. There's no sense in manipulating the fabric any more than you have to. Once you've got your beautiful stack of HST's, it's time to press them. So, lower your ironing board if you can (so you can sit), put in a good movie, grab a nice beverage (that you keep away from the ironing board, of course), and get as comfy as you can. It doesn't take hours, but you might as well enjoy yourself! By the way- do you know the difference between ironing and pressing? Believe me- to a quilter, there is a HUGE difference. Pressing involves putting the iron down on the fabric and allowing the weight of it to do the work. Pressing always means picking the iron up to move it. When pressing, you never move the iron back and forth, or pull the fabric with the iron. Be sure to always press your fabric, instead of ironing it. Open each HST, spray liberally with starch, and press with a very hot iron. I use my iron on the hottest setting. The starch will add stability to the bias edges, but keep in mind that if you rub your iron on the fabric, they will get distorted even more easily when wet. Take your scissors and trim the little dog ears from each side... and that's all the trimming we're going to do! See? A beautiful little stack of HST's without too much fuss! Once you have this, you'll have a finished quilt top in no time. Of course your HST's are still in order, so laying out your blocks will be a snap! Just lay them with the diagonal seams going in alternating directions to create the chevron pattern. Notice that you have 16 HST's with each fabric- 8 with the fabric above it in the quilt, and 8 with the fabric below it. So, lay out your blocks in rows of 8. Once you have it all laid out, pick up your rows from left to right. Sew the blocks into rows, and sew the rows together. Your finished quilt top should measure about 46x58. Easy peasy, right? 1. If you want to make the quilt bigger, you can start your HST's with bigger starting squares, or you can make your quilt have more than 8 blocks across. To keep it easy with the "four at a time" HST method, you could increase the width to 12 blocks across. 2. You can use a solid color for every other chevron, and use several fabrics in the others, giving it a scrappy look. If you choose to do this, then you wouldn't need to worry about pairing the fabrics, since every print would be paired with a consistent solid, making it really easy! 3. You could use just a few fabrics and repeat them in order. The bottom line is- chevron quilts aren't nearly as tough as they seem! Once you master the HST, not only will chevron quilts be a breeze, but the door to tons of other patterns will be opened to you as well! I hope you give it a try! Edited 9/14- Here is a picture of the finished quilt. Check out the full post with other photos HERE! Great tutorial, Kelly! Love that fabric palette you used! Awesome Kelly! I love to look at the chevrons, but haven't wanted to make one yet. If I change my mind, I'll do it your way for sure! Your chevron quilt is soo adorable. Love your choice of fabrics. You get so much done! I have never even heard of making HSTs that way, looks so easy! Great tutorial, I'm going to have to try it out. Thanks! Thank you for the great tutorial. I am heading up for shopping with my daughter on Saturday and one of the nearest, biggest quilt shops just announced it is going out of business and having a sale--I just might have to splurge on 11 fat quarters to make one! Thanks for sharing this HST tutorial and the matching maths! You fabric choice is superb! I've never made HSTs using that technique... this is going on my Make Soon (2014) list! Love it. Thank you! My niece is having a baby this fall and loves chevrons. I really like your organization ideas - I know my colors would be messed up without them. Thanks for the great tutorial. This tut is a keeper! Thanks so much for the "Easy peasy" instructions Kelly. I love your blog. That does seem easy peasy! Thanks for the tute! I love this one! Chevrons make me smile and your work with them is the icing on the cake! This is definitely going on my to-do list. I love your blog - it is my top favorite! It looks so easy now. I put it on my to do list too! Thanks for sharing! Great tutorial and I love the fabrics you chose for yours. I love doing HST anyway, so this will be on my to do list very soon. Thanks much for all the great pictures at each step of the way. Very good instructions Kelly. Love the fabrics you chose for this. Nicely done. always enjoy your blog. Thanks Kelly! This one is getting a pin in it! What a cute chevron quilt and awesome tutorial! Beautiful quilt. I love the colors you chose. I still haven't made a chevron quilt even with how easy peasy it is, just like your great tutorial showed. Beautiful quilt. Great instructions. Been wanting to make a chevron quilt for a long time. Just got too many projects started. I have had a bit of a quilting block this past week but after seeing this post, that is long gone. I definitely have my next project! Thanks so much for sharing, it's beautiful, and I am inspired. Can't wait to get started. Thank you! With these wonderful instructions I should be able to do this!! Thank you so much for this clear tutorial! Just what I needed! I have had my group of fabrics set aside for quite a while, and knew I wanted to do a chevron quilt, but didn't really understand how to order the cutting and so on! NOW it is easy! I've been looking for beginner baby quilt patterns and this looks great! I love the blog. Great tutorial! Can you share how much fabric you used for border, backing, and binding? Thanks! The border is 4 inches finished, so I just cut 4 or five strips at 4.5 inches, the full width of the fabric. For binding, I cut 2.5 inch strips, width of fabric, and used 6 strips, I think. So about half a yard in binding fabric, 1 yard of border fabric. For the backing I used a lot of scraps, so it changed my yardage, but for a full backing, you could probably use about 3.5 yards. Hope this helps! Hmmm... you mentioned the difference between Ironing and Pressing (which I didn't realize there was much of a difference), but I can't figure out, except maybe the later statement is the pressing and the first part is the "Ironing". Wonderful! Thank you very much. I was just trying to figure out how to eliminate the solid fabric in between the chevrons. This will do it! Wow! I absolutely adore chevrons and I love how you made this look so easy. I don't make quilts (although your post may have convinced me to do so), but I will definitely will be using this to make a smaller version to make bags. Thanks!!!! This blog post just changed my life. CHANGED. MY. LIFE. Quick Questions: How big is the quilt when done? Do ya think it would look good without the border? So glad we have this tutorial linked under our Chevron Quilt theme!! This method of making HSTs beats any other method i have seen Hands Down !~! It's painless, quick and easy as pizza with Boboli crust and sauce already in the freezer. Thanks so much for sharing this tute. It changed my life with HSTs and I bet it will for others too. It's so much quicker and cleaner and sharper !~! Love this technique! Would you say that using fabrics with larger patterns or motifs might not look as good as small all-over prints? Thank you so much! Actually, I think that this works for large or small scale prints! Stephanie, the quilt will be 8 blocks across, so you will want them to finish at 5 inches, for a total of 40 inches in width. If you start out with 8 inch squares, that should give you a quilt top that will fit your backing. The quilt has 10 rows of blocks, which would only give you 50 inches in length, so to make a quilt 60 inches long, you would need to have 12 rows with 13 fabrics. I hope this helps! Good luck! Simply brilliant! I just ran across this while looking up chevron quilts. I'm definitely going to be trying this method out in the future. I HATE HST but this makes my dislike lesson somewhat! Great looking quilt and thanks for the tut! Thank you Amber. Good luck with it! I promise, this method is really straightforward! Hi, I wanted to try your method of making a quilt but the fabric I like doesn't come in fat quarters. How much of each fabric will I need to purchase if I use 11 different fabrics? Trying to figure out how I will ask for this at the fabric store cut counter once I pick out my fabrics. Thanks. You will need to be able to cut 9 inch squares, so quarter yard cuts will work just fine! Since a quarter yard is exactly 9 inches, be sure you get the full quarter yard! i made a gorgeous quilt for my granddaughter using this pattern in a rainbow of hand dyed fabrics (my own!). i machine embroidered her name in hebrew with flowers and musical notes because her name means song in hebrew. i can't seem to upload the pic, but it was lovely. Hello! My grandma has graciously offered to make this quilt for me for a queen size bed- how many squares should she use? We will not be using a border. Hope you can help! Haylee, a generous queen size is roughly 80x100". So I would make the quilt 14 blocks across (width) and 17 blocks in length. Hope this helps! Love your chevron quilt! The colors are so much fun! I would love to make this quilt as a twin size for my friend's new baby. I have 10 fabrics picked out. I'm trying to figure out the size of the squares I would need to cut to start with. I would like to do a border. I'm having trouble figuring out the conversion from a final size, and I'm having trouble finding what size a standard twin quilt should be! At the moment I'm thinking if I start with a 10.4" square, it will give me 6.5" finished squares which will give me 52" wide by 65" long. Adding a 4" border will give me a finished quilt of 60" wide by 73" long. Is this right? Or am I better off with a different size starting square? It sounds to me like you've figured it our properly. 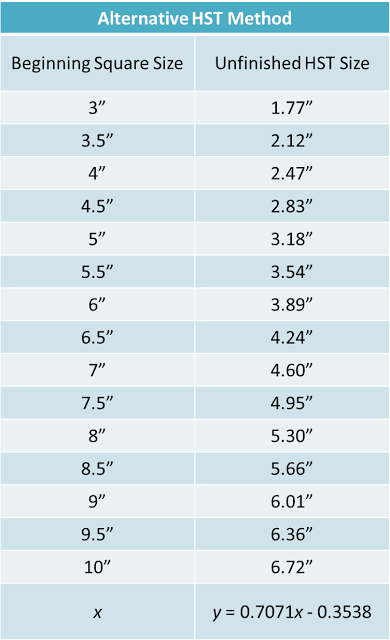 Here is a link to many helpful charts, including a great one with quilt sizes! I'm writing a blog post for my guild and have included a link to this tutorial. I would like to use the first picture in this post of yours as a thumbnail next to the link. If this is NOT okay with you please notify me and I can change to the EQ drawing I made, however your picture is much prettier. Thanks. Love the tut. Super easy. Just now making mine. Thank you very much for the tutorial. I used it to make my daughters quilt. Thank you so much from a beginner quilter!! This made it so easy to understand. You girls are great for sharing your knowledge and experience!!! Just love this quilt. Great instructions and so easy. Have you ever tried the strip method with piecing rectangles together to form the zig zag? Which do you like better? I'm making a halloween quilt using this tutorial. Hope to post it in a Thursday link party soon. Why oh why could I not have found this tutorial BEFORE I started my chevron quilt. I have already cut all my wee triangles so I guess I'll just have to make another chevron quilt to try this out! :P Thanks very much! I love your pattern! I'm currently using it to make a satin quilt. This is my first time working with satin, but so far the quilt is coming together beautifully. Thanks for sharing this easy pattern! Hi I love the turorial. Could you please tell me how much fabric do I need, to do only two clours single bed quilt. It will be much appreciated. This quilt measures 46x58 as I have made it. You would want to add one more set of four HST to each row to give you enough width for a twin bed, and you'd need to add 6 more rows to give enough length (so 16 rows). So, instead of four squares of each print, you would need 6 squares for each print row. With 8 rows of one fabric, and 8 rows of another fabric, you would need (48) 9" squares squares of each fabric. By my math, that is 3 yards of each print you want to use. This pattern was great for a beginner. I made a crib size quilt and it is adorable. I would like to make one for a queen size bed. Can someone help me with the math. I am going to cut 10 1/2 inch squares to start with which makes about 6 1/2 inch HST. There is a post above from May, 2014 that reads: "a generous queen size is roughly 80x100". So I would make the quilt 14 blocks across (width) and 17 blocks in length" what size blocks does this one start and HST size before piecing it all together? Thanks for your help! I'm so glad you like it, Terri! I would do 13 blocks across (84.5" wide), by 16 blocks long (104" long). The HST will finish at 6.5." In this quilt, I started with 9 inch squares, which yields 5.5" finished HST. Good luck with it! Kellys, thanks for the great tutorial, now I can't wait to make a baby quilt for my daughter in law. Can you please help me with the math, what size should I cut my squares for the correct dimensions of a baby quilt? you're welcome! This quilt is 46" x 58" which I consider a generous baby quilt size. I cut my squares at 9 inches. If I use a one way pattern fabric, will I have a problem? Since you are cutting the HST across the bias, your print will be diagonal, so you may want to choose a pattern that is non-directional. How many fat quarters of each pattern do you need for a baby quilt?